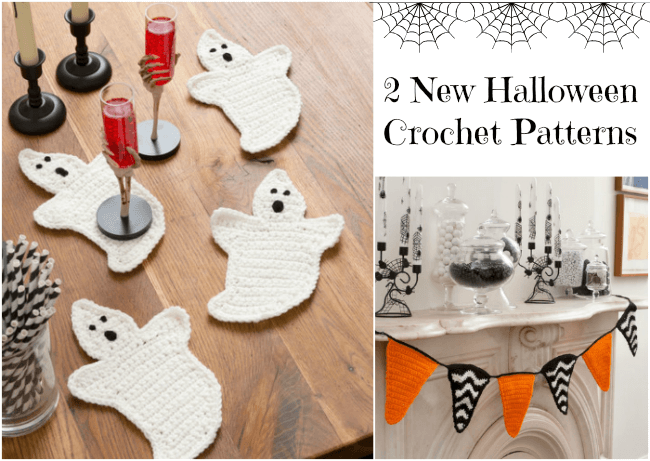 I am very excited to show you the two new Halloween crochet patterns that I designed for Red Heart … ghost coasters and a festive party banner!! 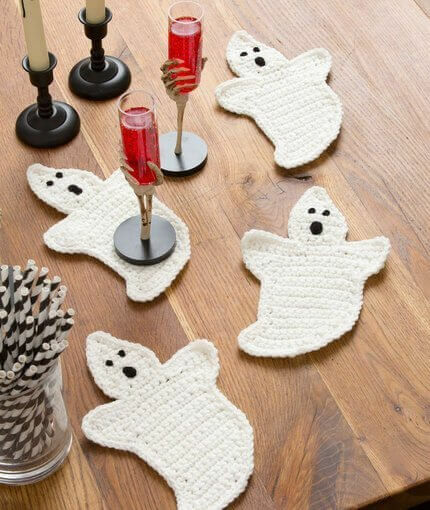 These ghost crochet coasters are so scary-sweet and would add such a fun touch to your Halloween entertaining. They are super quick and easy to work up too! You can download the free pattern directly from Red Heart by clicking here. And of course no holiday would be complete without a festive banner. 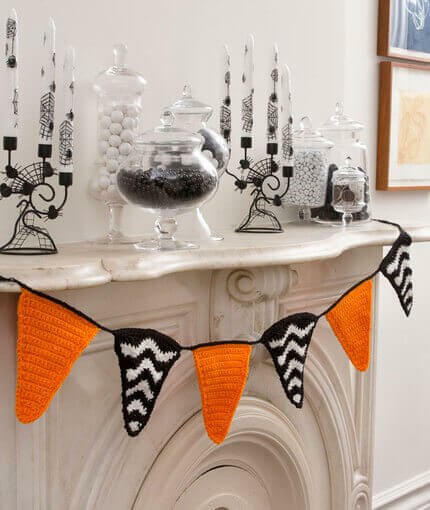 This one is worked with an alternating orange and black and white chevron design and again is a quick and simple addition for your Halloween decor. Click here to download the free Halloween Banner pattern from Red Heart. 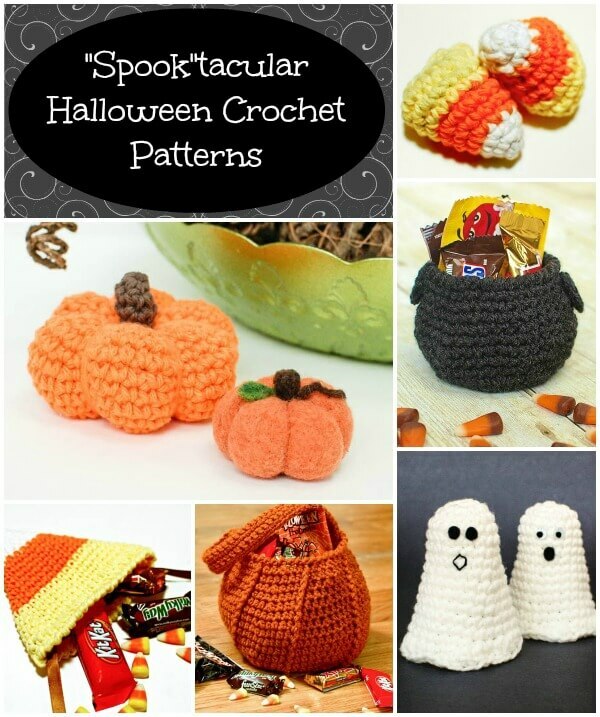 And if you are looking for even more projects for your Halloween crafting, check out all my free Halloween Crochet Patterns here. Oh I’m such a dummy! Now I have understand my translation mistake! It’s very easy to do! Sorry to disturb you! Thank you for this lovely project! As I’m a beginner and french too (so with double handicap! ), there is a little thing I can’t understand in the ghost’s pattern:when you write “turn” what does it mean?Do you mean turn around the raw? Thank you to help me to realise your funny pattern! cute little patterns for Hallowe’en, I’ve downloaded them to make. I’m visiting from Hookin’ on Hump Day. Those little ghost coasters are so cute and lovely (I mean terrifying!) You are so clever! Thanks for the links to the free patterns too. Awww … you are too sweet, Marilyn! Merci beaucoup pour tous ces superbes liens. So happy you like them, Debi! How can I get into the ghost coaster patterns? Thank you! !